CarbonX is combatting climate change with blockchain technology. 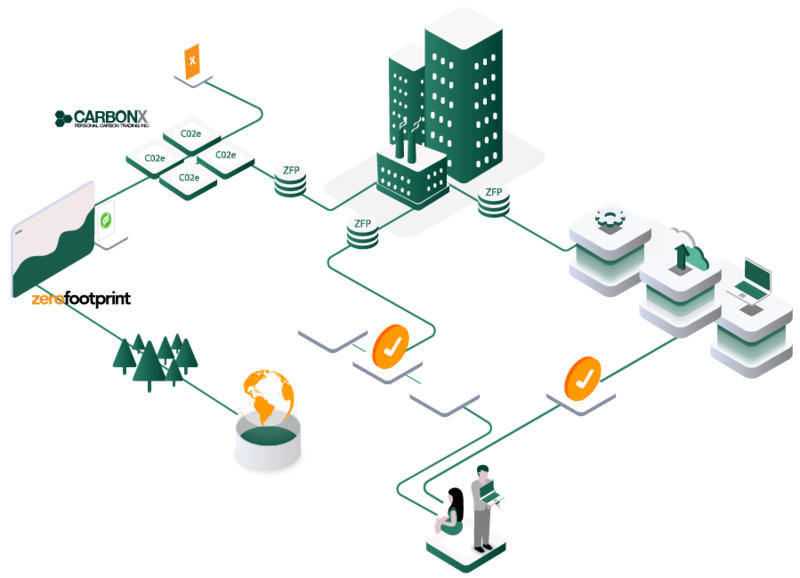 CarbonX engages millions of people in the fight against climate change by providing a network platform for companies to easily and efficiently offset their carbon emissions and create demand for their carbon-neutral products and services. PREVENTING GLOBAL TEMPERATURES FROM RISING 2°C IS ESSENTIAL TO WORLD PROSPERITY. The world is recognizing that climate change is an environmental crisis threatening global prosperity. The risk to global stability and financial markets has been articulated by Mark Carney and Michael Bloomberg at the Task Force for Climate Related Financial Disclosures. If you are a business person, then you must factor risk from Climate Change in your future plans. World over, companies need to act now and re-organize to become carbon neutral. 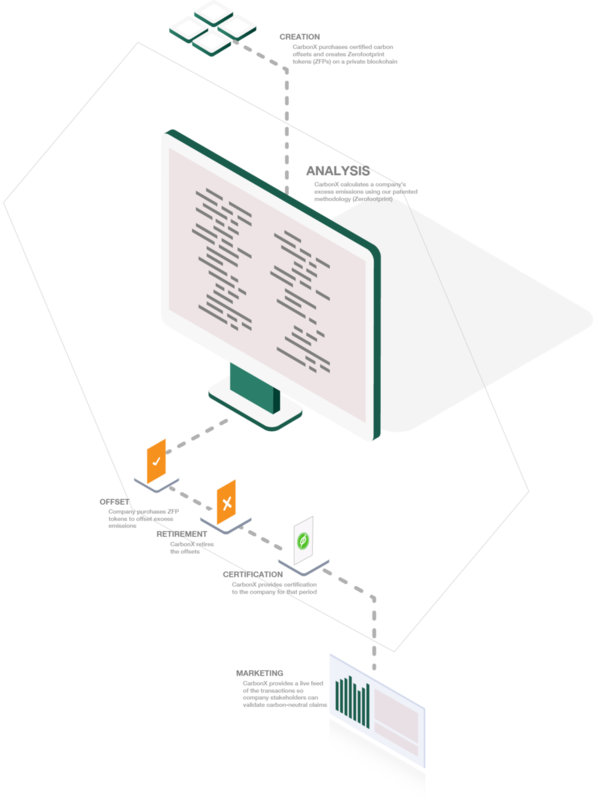 CarbonX sources and recasts carbon offsets as tokens on a private blockchain, thereby validating provenance and ensuring the security and transparency of all transactions. Our Zerofootprint® program assess the carbon impact of products and services, then balances that impact with carbon offsets to certify the carbon neutrality of products and services and assure customers that they are making sustainable choices in their buying behavior. Our GOODcoins™ program further engages consumers by rewarding them for choosing Zerofootprint® certificed products. The provenance of these offsets can be independently validated by your shareholders, employees, and customers via a feed of the transactions that can be used as proof of your carbon neutrality status. Plus, with the GOODcoins™ program, CarbonX can help to incentivize consumers to choose your carbon-neutral products and services. Zerofootprint® is recognized by the Obama White House, the Clinton Foundation, and the government of Ontario. Through the GOODcoins™ program, companies can reward shareholders, consumers or employees for making carbon-friendly decisions, and further incent demand for their products and services. Companies that are certified by Zerofootprint® can offer ZFP tokens to their stakeholders as incentives to purchase carbon-friendly goods and services. When those ZFP tokens are redeemed (initially via the ZFP Network website), they can be used to offset the company’s excess emissions – a win-win-win for the company, the consumer, and the environment. CarbonX sources our carbon offsets from local geography or national projects such as methane capture, forestry, and other UNFCC certified projects. Don is a recognized world leading authority on innovation, media, and the economic and social impact of technology on business and government. He is the author of 15 books, available in all major languages including the bestsellers - Paradigm Shift, The Digital Economy and Wikinomics. His most recent book (May 2016): The Blockchain Revolution: How the Underlying Technology of Bitcoin and Other Cryptocurrencies is Changing the World: explores the fundamental way this new protocol will transform business in the second Era of the Internet. The book quickly rose to the top of the bestseller lists at the New York Times and Amazon. Don is a sought after advisor by Fortune 100 Industry and Governments across the world and has deep networked connections throughout the world economy. Bill has founded, co-founded and led a number of successful technology start-up companies in Toronto over the past 25 years, including: IntelliOne, a world leading method of processing mobile phone data to generate bulk geo-location and traffic information; Maptuit, a navigation and optimization software company in Transportation Logistics; and, Mountain Lake Software, a custom software development company with a strong financial services practice. These companies became acquisition targets of larger organizations for their strategic value. Bill is an Advisory Board Member of Jonah Group, a 120-person software services company with clients in financial services, US Healthcare and emerging blockchain enabled biz models. Bill has a long standing interest in Cleantech and until recently was on the Investment Committee of The Atmospheric Fund. Jane is a senior digital executive with over 20 years of experience leading marketing, strategy and operations for technology-based companies. Most recently, she was the CMO of Exchange Solutions, a leading provider of loyalty programs for national retailers and banks, with a client roster including Esso, Scotiabank, Sears and Lowes. Prior to that, Jane was the VP of Strategic Projects for Lavalife, where she spearheaded the company’s international expansion as well as the launch of LavalifePrime, a niche dating site which acquired over 40k members within its first year. Jane also has an entrepreneurial bent, having co-founded one of Canada’s leading digital agencies, Medium One Productions. The company was sold to Mosaic Group Inc.
Elaine is an experienced environmental engineer and has managed 100's of projects to compute the GHG inventories of global corporations using the Zerofootprint® methodology. In addition to Zerofootprint®, she is familiar with other industry standard emissions analysis methodologies as practiced by the CDP, UNFCC and to ISO-14064 standards. Elaine also managed the GOODcoins™ program and co-managed the development of an on-line personal carbon calculator for a 14,000 employee software services employee group. Elaine holds an Honours B.SC. in Environmental studies from the University of Waterloo. Sharon is an accomplished Project Consultant with a history of contributing to a client's success through project delivery and Executive Search in Financial Services, Information Technology and Cleantech Industries in Canada, the US, and the UK. An early advocate for sustainable development, Sharon assisted The World Watch Institute, an environmental think tank based in Washington D.C. in developing a research program (The New Economy Council) and secured the founding financial partner from industry for its inception. Earlier she has helped companies build high profile Boards and find ‘C’ level individuals across a broad corporate spectrum for sustainable energy companies through the UK and Asia. For Investment Banks she has carried out numerous executive recruiting projects for positions in Systems Architecture and Development, Trading and Cyber Security. Her network of contacts covers the world's leading figures in Finance and Cleantech. Drew is one of the three founders of Jonah Group, a 100+ person software consultancy in Toronto. Jonah Group designs and builds high-performance custom technology solutions with an emphasis on great user experience, robust architecture and high business value. The team creates software for North American clients in areas including: capital markets, loyalty, health and retail financial services technology. Drew has over 30 years of experience as a senior software architect and project manager. He’s managed technical departments for several software companies, as well as planned, designed and rolled out many large business-critical projects. Ron founded Zerofootprint®, a revolutionary software company that invested in carbon reduction projects and pioneered reward tokens to motivate and habituate social and behavioral change – GOODcoins™. In 12 years, Zerofootprint® guided over 250 companies in assessing and reducing carbon emissions. Prior to Zerofootprint®, Ron founded Algorithmics, the world’s first and largest enterprise risk software company – until it was sold to Fitch in 2005, then again to IBM in 2012. Algorithmics was recognized as one of Canada’s 50 Best Managed companies while Ron was at the helm. Ron has enjoyed a distinguished career including 10 years at Yale University as Professor of Operations Research and Computer Science where he completed a Phd. Ron is a recognized icon of Fintech and Cleantech in North America and his current interests include advising I-Banks in risk management and considering climate change risk in portfolios. In 2007, Ron was honored as a lifetime Fields Institute Fellow for his contribution to Canadian Mathematics in 2007. Bruce Burrows is an accomplished Senior Executive and Consultant with more than 32 years of success in the higher education, telecom, transportation, and retail industries. Bruce is a strategic leader with a unique combination of strong Business IQ and deep technology acumen. His broad areas of expertise include operations systems, customer service, inventory management, airline, food service, retail, mass merchandizing, department, specialty, grocery and drug store retailing, strategic planning, analytics, problem-solving, technology enablement, loyalty programs and change management. Throughout his executive career, Bruce has held leadership positions of progressive seniority with Loblaw Companies Limited, Hudson’s Bay Company (Hbc); Dylex Limited; Scott’s Food Services; Wardair Canada, and Ritchie & Associates. In his last role as EVP and Chief Information Officer Enterprise Information Technology at Loblaw, among his accomplishments were: the successful implementation of SAP-ERP; integration of the information technology division from a $12 billion acquisition and re-engineering the IT operating model in the $46 billion retailer. Bruce holds an Honours Bachelor of Business Administration from Wilfrid Laurier University and has served on the Global Advisory Boards for SAP, JDA, and Bell. Joseph has been a pioneer in shaping Canada’s carbon market since 2004, building innovative offset projects, contributing to the development of strong standards, and helping society understand the role of ecosystem-based projects in halting climate change. He developed first-of projects in forestry, fuel switching and transportation, founded CPS Carbon Project Solutions Inc., as well as the Blockchain for Climate Foundation who are “Putting the Paris Agreement on the Blockchain.” A 2019 “Canada’s Clean50” award winner, Joseph’s work, insight and advocacy have been of great benefit to CarbonX since the beginning. Joseph loves to explore old-growth forests and paddle beautiful coastal inlets with his wife. A new father, the experience of living amidst diverse people, cultures and ideas foster insight and enthusiasm for his work. Nick Zelenczuk, FCA, FCPA was the Senior Managing Director and Chief Operations Officer at Canada Pension Plan Investment Board (CPPIB) until May 2018. While at CPPIB Nick was responsible for strategy, operations, technology and data management, human resources and public affairs. He joined CPPIB as their CFO. Nick has more than 30 years of experience in the financial services industry. He has held a number of senior roles in investment banking, telecommunications, and consulting. Earlier in his career, he served as President and CEO of Deutsche Bank Canada. Along with advising CarbonX, Nick serves on several Boards including Wilton Re Ltd. (a life re-insurance company), and Trillium Health Partners (a leading community hospital).